The Wayland is an applied molding door with a simple ‘humped’ molding at the framing bead. 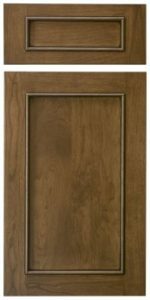 Very understated and clean-lined, this is a great transitional or contemporary design to consider if you are looking for a unique, but uncluttered door design. Yes - P-057, P-602, M-Bead, Presidential, Reverse G-Cove, & RM only.